Thus read the recent headline in the Omaha World-Herald. For the last 14 years, the family of Meriwether Lewis has been petitioning the National Park Service to allow them to have the body of their famous ancestor exhumed from his Tennessee grave. They’ve even banked DNA so that it can be determined beyond a doubt that the body in the grave is Lewis, and with modern forensic techiques, they hope to settle the historical mystery that surrounds his tragic death just three years after returning home in triumph from the Pacific Ocean. Was it suicide or murder? Our novel To the Ends of the Earth is all about the mystery of Lewis’s death, so I’m keenly interested to see how the discussion comes out. I understand the feelings of those who say they wish to let Lewis rest in peace, but given the enthusiasm of the family for the project and the fact that they are willing to pay for it, I think the Park Service should allow them to proceed. While no expert on historical forensics, I have watched enough PBS documentaries to know that there are wonders being performed in the field; for example, the work being done at Jamestown is rewriting what was known about that colony. If Lewis’s body is in reasonable condition, it is possible that there is still much to learn about the death of a great American hero. He lies buried close by the common path, with a few loose rails thrown over his grave. I gave Grinder money to put a post fence around it, to shelter it from the hogs, and from the wolves; and he gave me his written promise he would do it. I left this place in a very melancholy mood, which was not much allayed by the prospect of the gloomy and savage wilderness which I was just entering alone. 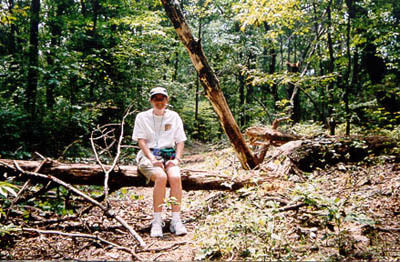 Mary on the Old Natchez Trace -- tree down! Fortunately for Lewis’s friends today, the “gloomy and savage wilderness” has been transformed into the magnificent Natchez Trace Parkway. But numerous sections of the Old Trace remain, and I highly recommended you stop often along this road to let the ancient trail come to life in your imagination. Even on the shortest hikes, vines intertwine in the tree canopy to make a dense green roof. Along the path, fallen trees lie with generations of old leaves and sticks. At one stop we saw the graves of unknown Confederate soldiers; at another, stands of dogwood that evoked the memory of Meriwether Lewis and his companions riding this wild, lonely road in the final days of his life in October, 1809. By 1843, the Chickasaw Indians had been forced to remove to Oklahoma, and the area was becoming settled by pioneers. 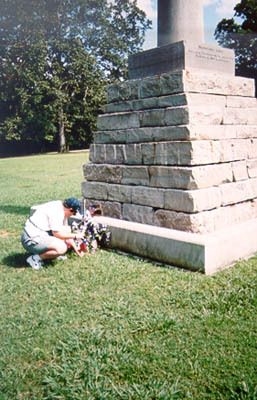 The Tennessee state law establishing the area as Lewis County paid tribute to the Trace’s most famous, if deceased, resident, but noted that the grave was “neglected.” In 1848, the state went even further, appropriating $500 (some $12,000 in today’s money) to erect a suitable monument at the gravesite. The Kirby family of stonemasons from nearby Columbia, Tennessee was chosen to do the work, and they created a strikingly large limestone “broken shaft,” symbolic of a life cut short. A monument committee “took great care to identify the grave,” though they recorded maddeningly few details of how they did so. By that time, Lewis had been joined by a pioneer cemetery, and it seems that more than one body was exhumed before the committee found Lewis. The coffin was positively identified by the blacksmith who had made its nails, and the “upper portion of the skeleton examined.” This indicates that at least as of 1848, water had not entered the grave and Lewis’s body had not turned to dust. The monument was placed over the grave, though it is unknown whether Lewis was placed in a new coffin or whether a vault was included with the reburial. The monument was then enclosed with a small iron rail fence, which remained until the Civil War when John Bell Hood’s troops liberated it to make horseshoes. 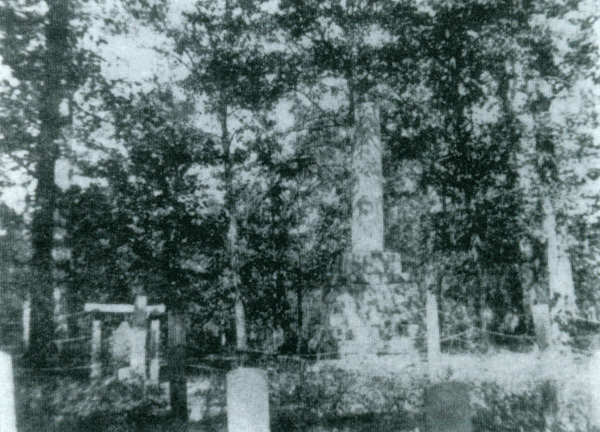 By the 1920s, the monument was described as a “sad wreck” defaced by graffiti, and the gravestones of the pioneers were decayed and crumbling. Historians and local civic leaders formed an association to renovate the monument. They had little trouble persuading President Calvin Coolidge to designate the gravesite as a national monument. 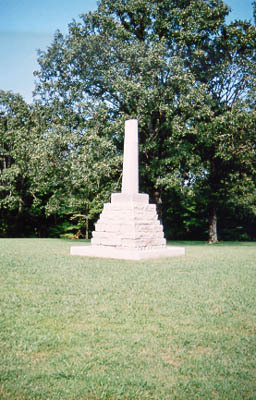 Under the enthusiastic direction of the staff at nearby Shiloh National Battlefield, the monument was reinforced and cemented and the shaft securely fastened back into place. A fence and large flagpole were erected, and the pioneer gravestones replaced with flat grave markers. Liz leaving a flag in remembrance of this great American who has come to mean so much to us. In the 1930s, the Civilian Conservation Corps did extensive work at the site, cleaning up the woods, clearing trails for hiking and horseback riding, and putting in erosion control. Eventually, the site became part of the Natchez Trace Parkway, with parking, picnic tables, a great campground, and a replica of Grinder’s Stand. In 2001, the stone base of the monument was replaced with a beautiful new base that made the inscriptions once again legible, and the monument was cleaned. In 2009, a graveside memorial service was held for Lewis to mark the 200th anniversary of his passing. Great slideshow of the 2009 ceremony. The combination of descendants, reenactors, and members of the military is genuinely moving. Thanks for the link to that slideshow. I love how some Americans celebrate their history and keep it alive. I’m not sure how I feel about Lewis’ descendants wanting to exhume his body and investigate this death. It’s been interesting to speculate how he died, but at the same time, it might be nice to find out what happened. Great post!